Snowfall in Buffalo broke records this week, with the city getting more snow in two days than it typically does in a year. 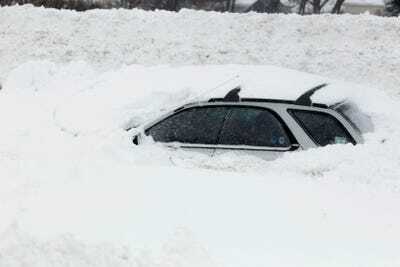 More than six feet of snow has barricaded people in their homes and stranded them in their cars. The weight of the snow has already caused 30 roofs to collapse, and 13 people have died from either exposure or heart attacks. 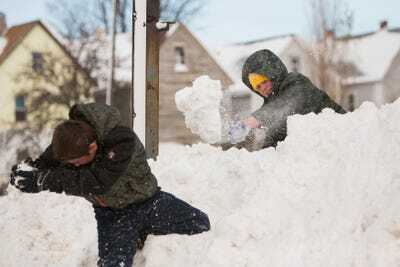 Buffalo residents aren’t usually fazed by snow. But the severity of this storm has caught many by surprise. The photos out of Buffalo are staggering. 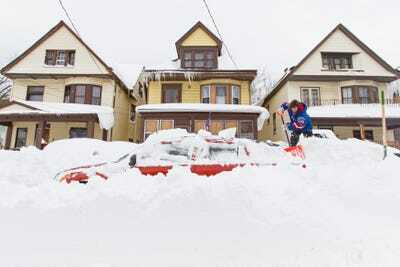 In just the first snowstorm of the winter, Buffalo already saw eight feet of snow in three days. 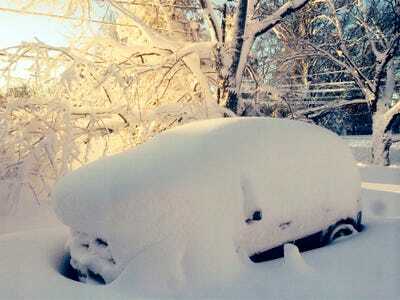 A car is covered in snow in Orchard Park outside of Buffalo, New York. While it's not official yet, this snowstorm may be the worst in Buffalo's history. 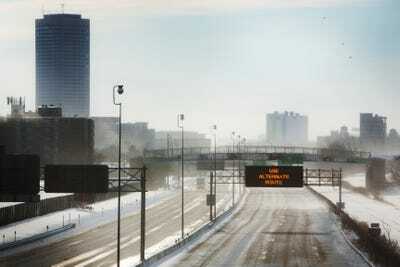 The previous record for a single day in Buffalo is 33.9 inches on Dec. 10, 1995, NOAA reports. 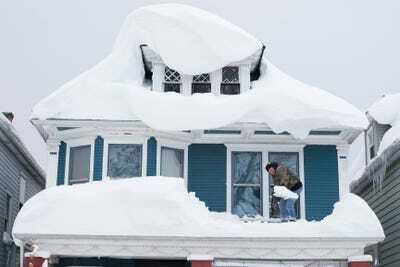 On Wednesday, 65 inches was reported in the Buffalo suburb of Cheektowaga. Children play in a snow pile in Buffalo, New York, November 20, 2014. Not only was the snowstorm epic, but along with it came lightning. Buffalo news is reporting at least seven strikes during the storm. 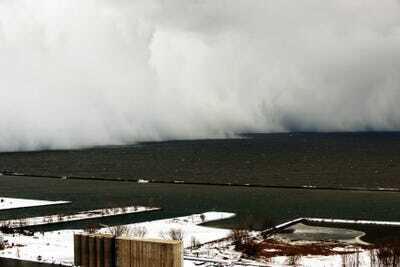 A lake-effect snow storm with freezing temperatures produces a wall of snow travelling over Lake Erie into Buffalo, New York. Governor Cuomo said that he anticipates the clean up after this 'historic event' to take four to five days at the least. New York Governor Andrew Cuomo's entourage makes its way on interstate I-190 to survey an area in West Seneca, New York November 19, 2014. A large danger still looms with the massive accumulation of snow on rooftops. Reports of roofs and other structures collapsing, especially in the city's mobile home parks. Since the storm, there have been 30 major roof collapses, as well as almost 90 minor ones, causing home and business owners to rush to clear their roofs of the heavy, wet snow. Workers shovel snow from a roof. 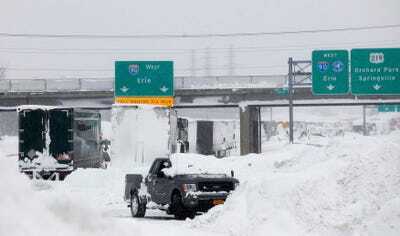 A vehicle is shown submerged in snow sits on interstate I-190 in West Seneca, New York. Sadly, the death toll rose to 13 on Friday when officials found a deceased man inside of his car, stuck under feet of snow. The National Guard has deployed more than 1,300 people after Cuomo declared a state of emergency. Efforts continue to grow as more guards come to help clean up and save lives, in what Governor Cuomo believes is the largest deployment in New York history. 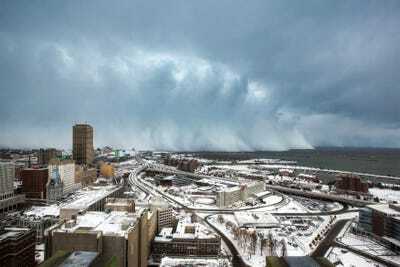 torm clouds and snow blows off Lake Erie in Buffalo, New York, November 18, 2014. Buffalo news reports that more than 5,000 civilians from other parts of the state have also come to Buffalo's aid, working to plow and shovel what they can. 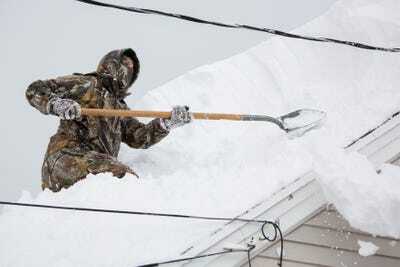 TJ Zydel works to clear his roof in the town of West Seneca near Buffalo, New York. In many of the hardest hit parts, there's too much snow to even plow. Instead, hundreds of city dump trucks have to literally haul the snow away. 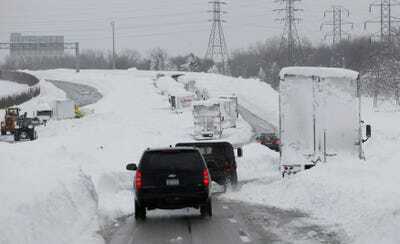 Snow blows across Route 190 in Buffalo, New York, November 19, 2014. 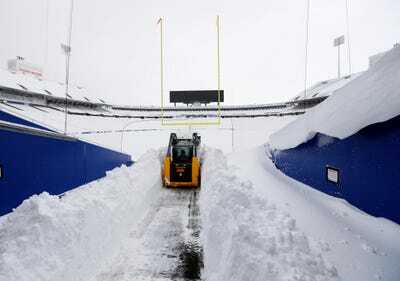 Buffalo Bills' Ralph Wilson Stadium accumulated an estimated 220,000 tons of snow, prompting them to offer $10 an hour to anyone who would help clear prior to their game with the New York Jets on Sunday. On Thursday, however, it was announced that the game had been moved to Detroit. 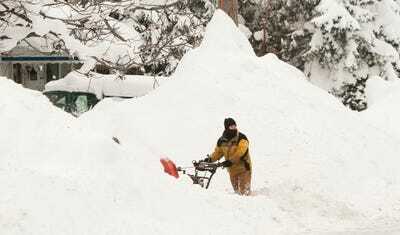 After a major snow storm a grounds crew worker begins to clear snow from the football field at Ralph Wilson Stadium. When the snow melts, it's expected by officials to create the equivalent of 6 inches of rain over two days, Richard Tobe, the deputy Erie County executive, told NBCNews. A man clears his driveway of snow following an autumn snow storm in Buffalo, New York. Hans Bengtson, know to everyone as 'Vild Hasse' ( Wild Horse ). 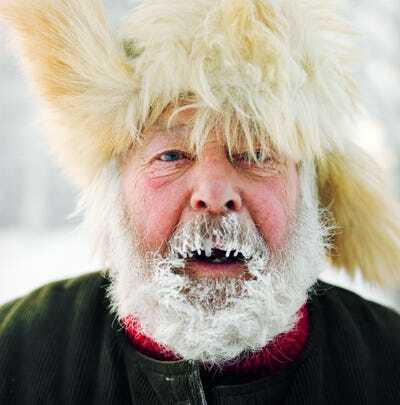 He is a self proclaimed ' master of glibness and a sausage poet ', who sells a wide range of mountain culinary delights. Jokkmokk winter market, Sweden. 2010.